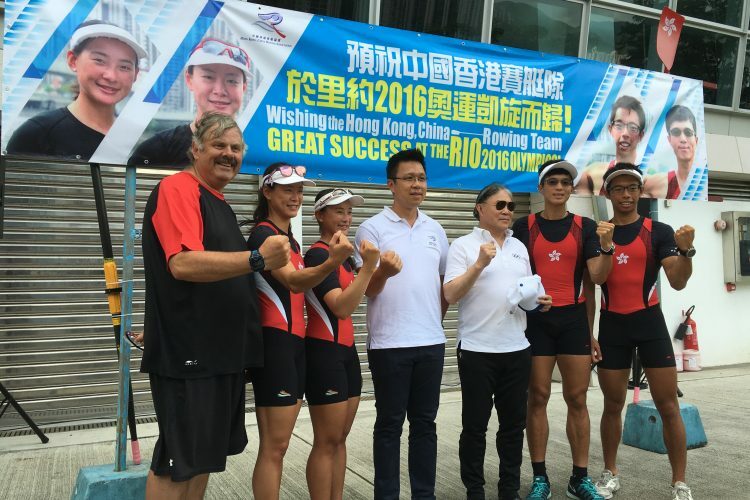 Hong Kong’s Olympic Rowing Team will shortly depart to Europe on the final phase of their preparations for Rio. The team comprises the men’s lightweight double scull of CHIU Hin Chun and TANG Chiu Mang, and the women’s lightweight double crewed by sisters LEE Ka Man and LEE Yuen Yin. HKSI Head Coach, Chris PERRY, and Coach Goken SAKAMOTO will accompany the team. Both crews have been training intensively since returning from the Asia and Oceania Olympic Qualification Regatta, held in Korea in April. The workload will step up even further once the teams arrive in Europe. Initially the team will train in Germany, and then compete at the season’s final World Cup Regatta in Poznan, Poland. After this, they will train in Belgium before flying directly to Rio on 30th July. Olympic heats for both Hong Kong crews will begin on 7th August, with finals from 10th to 13th August. A total of 20 crews will compete in both the men’s and women’s lightweight doubles events. Crews taking part from Asia will be China, Japan and Hong Kong in the men’s event, and China, Japan, Hong Kong and Vietnam in the women’s event. Hong Kong has qualified in the lightweight men’s doubles for the past four Olympic Games, but this is the first time to qualify in the women’s event. “In order to qualify, we had to build up to a racing peak for the qualification regatta in Korea. We did a lot of interval and pacing work for this. Now we have successfully qualified, we need to work on our power and endurance base again before we build up to the final peak in Rio. The lightweight doubles event is one of the most competitive of all Olympic boat classes. As all the crews have the same average racing weight so technical skill and power endurance are the deciding factors. We have analyzed the boat speed and stroke rates needed to get our crews to the semi-finals and this will decide our training levels for the coming weeks. We want to keep the focus on the process of training and rowing well – rather than thinking about the final result”. LEE Ka Man is the most experienced athlete on the team, having raced in the women’s single sculls at the Beijing Olympic Games in 2008. LEE also won two silver medals at the 2014 Asian Games in Korea, and is an IOC Olympic Scholarship holder. Her younger sister, LEE Yuen Yin, won a silver and bronze medal at the Asian Championships in 2015. On the men’s side, TANG Chiu Mang is also very experienced, having won two silver medals at the 2014 Asian Games. TANG holds a Panasonic Scholarship. His partner, CHIU Hin Chun, was originally a member of the HKSI windsurfing squad and only took up rowing in the summer 2013, after joining a Rowing Talent Identification Day. He was an Asian Championship finalist in 2015. A “Meet the Media” session was held at the Hong Kong Sports Institute at 15:00 on 1st June and this will be final opportunity for the media to meet the team before they depart. The HKCRA wishes the team to achieve the best ever results in the Rio Olympics!